These flavorful Tofu Steaks With Avocado Chimichurri is so satisfying. Slabs of marinated tofu baked and topped with piquant and creamy avocado chimichurri. You may ask, what is chimichurri? Chimichurri is a flavorful uncooked green sauce from Argentina and Uruguay made from parsley, oregano, olive oil, garlic, vinegar, and red pepper flakes. Many variations are done, which may include, cilantro, cumin, paprika, thyme, lemon, and basil. 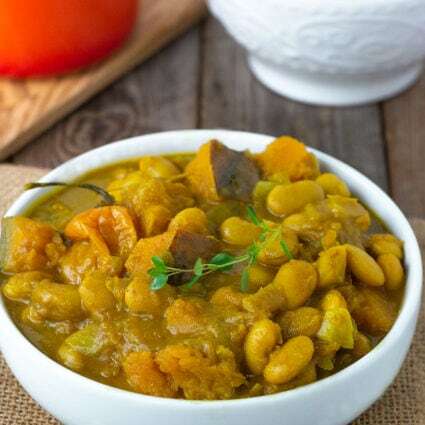 It is traditionally used for grilled meats, where it either used as a marinade, spooned on grilled meat while cooking or served as a condiment. 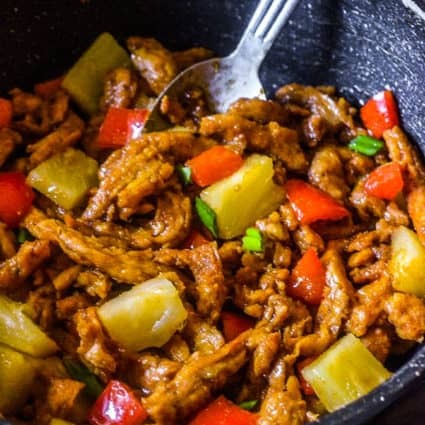 I love to prepare tofu as a meat substitute for my delicious Smothered Tofu Chicken, Teriyaki Tofu, and my General Tso's Tofu. For tofu with a great texture, purchase a high protein tofu that has a label that says super-firm. Super-firm tofu is exactly that, it doesn't require any squeezing of excess water nor pressing. However, if it is not available, then the extra firm will work. Remove tofu from the carton, discard liquid. Place tofu between paper towels or dish towel and rest on a plate. Place something heavy (a book or a skillet) on top of tofu for at least an hour. The weights help to release the water and the towels will absorb it. This will ensure a firmer and chewy texture. Next slice tofu into thick slices, brush marinade and allow to marinate for about 20 minutes, bake tofu while preparing the chimichurri. Once tofu is baked then serve with chimichurri. 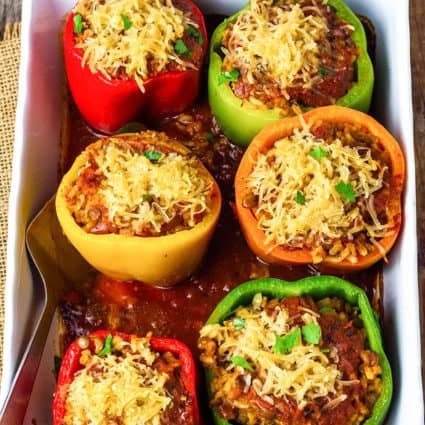 If you make this recipe, snap a photo and hashtag #healthierstep — we love to see your recipes on Instagram, Facebook & Twitter! Preheat oven 400 degrees. Line baking sheet with parchment paper and lightly brush with oil or spray. Set aside. Drain, press tofu (if not super-firm) and cut on the narrow side into about 8 slices. Combine Bragg's liquid aminos, maple syrup, sesame oil, onion powder, garlic powder, paprika, nutritional yeast flakes, cumin and thyme in a small bowl and mix well. Brush marinade on tofu slices and allow to marinate for 20 minutes. Meanwhile, prepare the chimichurri sauce. 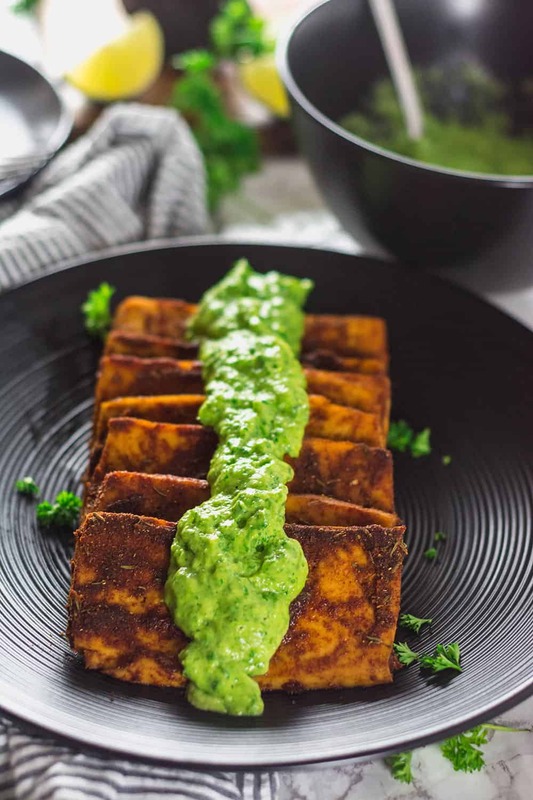 To prepare the avocado chimichurri, add cilantro, parsley, onion, garlic, olive oil, lemon juice, avocado, oregano, cayenne pepper and salt to a high-speed blender or food processor and process until smooth or chunky. Place tofu slices onto baking sheet and brush with oil. Bake for 30 minutes turning halfway. 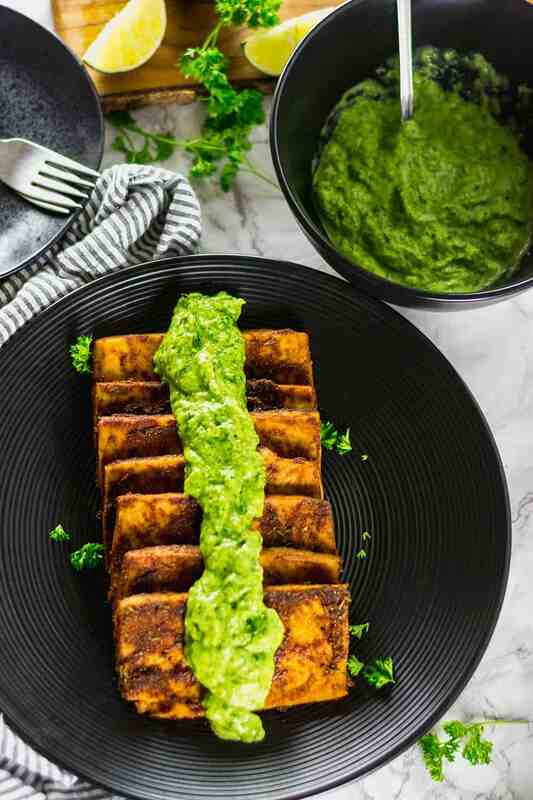 Serve tofu topped with avocado chimichurri. This was seriously amazing!! I didnt want to brush my teeth before going to bed because I wanted to keep the flavor in my mouth! I made it with basmati rice! Looking forward to cook it again! Wow Jg, love your feedback, you have me cracking up!!! Thank you. This was delicious!!! My male friend loved this! I used what I had at the house so I used smoked paprika. It added a great flavor. My chimichurri ended up being more of a pesto. I added some leftover pistachios and spinach. It still turned out delicious. Thank you for this recipe. Niki, I love that you and your friend loved it. Love your variation of the chimichurri sauce. Thank you very much for your response. These are absolutely delicious. The chimichurri sauce is insane. It’s one of my favorite sauces and it just works so perfectly with the tofu in that marinade. It’s perfect, if you ask me. Thank you for this. It’s already made it into my weekly rotation. Cassie, thank you very much for your feedback, I’m so happy you love it!